Tens of millions of tons of materials are floated up and down the Monongahela River each year. And in 2001, no shipment generated more interest than the 16,800-ton Braddock Dam Segment #1. Thousands watched from the riverbanks and on television as it made its way 27 miles up the Ohio River from a casting basin in neighboring Leetsdale, into the Mon, and finally to its installation point as part of the new Braddock Locks and Dam Project. This marked the first time in civil engineering history that float-in technology was used to create an inland navigation dam. This segment, and subsequently Segment #2, was fabricated on land, shipped upriver, meticulously floated into place, and finally submerged onto previously constructed foundations. Once in place, Segments #1 and #2 made up the lower third of the pier bases and overflow sections of the new five-bay gated dam. The balance of construction was completed from a floating plant at the dam site. The dam project was completed in April 2004. Just as those who marveled at its novel trip up the river, professional organizations were taken by its innovation in design and construction. 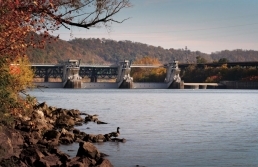 In 2003, the Braddock Dam was named the Engineers’ Society of Western Pennsylvania’s Project of the Year. The project was a finalist for the 2004 American Society of Civil Engineers’ Outstanding Civil Engineering Achievement Award, and it garnered the Civil Engineering Achievement Award from the Pittsburgh Section of the American Society of Civil Engineers in 2005. In a documentary on the history of the U.S. Army Corps of Engineers, The History Channel highlighted the project in its series, Modern Marvels. Today, it continues to inspire awe in all who learn about it. And in all of us who worked on it.